There’s something about the first person narrative that can really make a spy novel come alive. I think it’s the fact that you are stuck inside the spy’s head with all the paranoia that being alone and undercover would require. 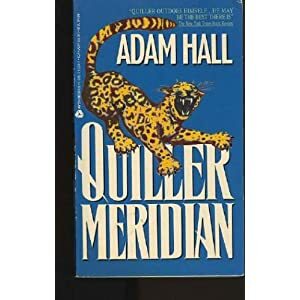 There was no writer better at this than Adam Hall in his Quiller novels. His spy, codenamed Quiller, worked for a secret government organization that reported directly to the Prime Minister. Quiller’s refusal to carry a gun, he claimed it made you weak, and need to work without backup, he was also the ultimate loner, is what distinguishes him from other spy characters. In Quiller Meridian, he is sent to Russia to clean up the mess another agent has made of a mission. The resulting chaos includes a trip on the Orient Express, explosions, and, of course, the Russian Military and Police forces trying to stop Quiller from achieving his objective. Last Words: With a seemingly endless supply of cliffhangers and a truly great first person perspective this is one of Hall’s stronger Quiller entries.